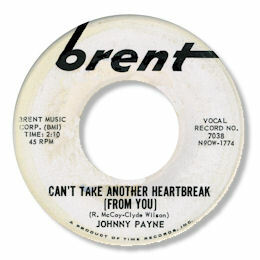 Bob Shad’s New York based Brent label had some interesting releases – 45s by the Moovers, Lewis Clark and Danny & The Velaires for example – but this rarity from Johnny Payne may just be the best of them all. Can’t Take Another Heartbreak (From You) is an early soul song with a few rather nice doo wop touches. But what brings it to these pages is Payne’s great vocal – full of gospel flourishes and bluesy screams as he roars out his pain. A purist like me would rather the female chorus was further back in the mix but you can’t have everything. The lightwieight “Tinklin’ Bells” has some charm and has also garnered some dance plays.